We have some (I am sure welcome) addition to our family of tool types supported by HSMAdvisor. The new tool type is "Boring Head". 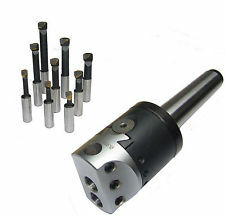 This tool is used for finishing holes on milling centres. Also in this release I have made a lot of improvements to operation of myCut Database and revised ssuggested depth of cut for milling tools when used at low radial engagement. More details on the HSMAdvisor Download page.